Hey there. This story is old news for those of you that follow me on Facebook, but I wanted to make a post about it to get into the story and details behind it. My youngest daughter smashed her finger. She did it herself by accident. She did it with the car door. My wife had to unlock the door and open it to free our daughter. That's how hard she slammed the door... and the end result was not pretty. Check it out after 2 days. Yup... It's black. At first, it only looked a little bruised. It didn't hurt when I flexed her finger and she seemed ok once the initial pain went away. I didn't think that she would need medical care. It did swell up a little and thought that an ice pack on it would be good and check it out in the morning to make sure she's ok. Her finger looked bruised the next day but nothing to worry about. It was expected since she took a hit to her finger. She went to school with a huge smile on her face like it was no big deal. When she got home, there is a letter attached to her folder stating that the nurse thinks her finger may be infected. Infected?!?! How can that be if she didn't even bleed? Nevertheless, we didn't take any chances and my wife took her to see a doc the next day. The doc says that she will need to go to urgent care right away. Urgent care?!?!?! What the... we didn't even think it was that serious, why urgent care? After hours in urgent care, because urgency has a different meaning in California.... -.- ... we finally see a doc. I look at my baby's finger and instead of a bruise, you see the above picture. 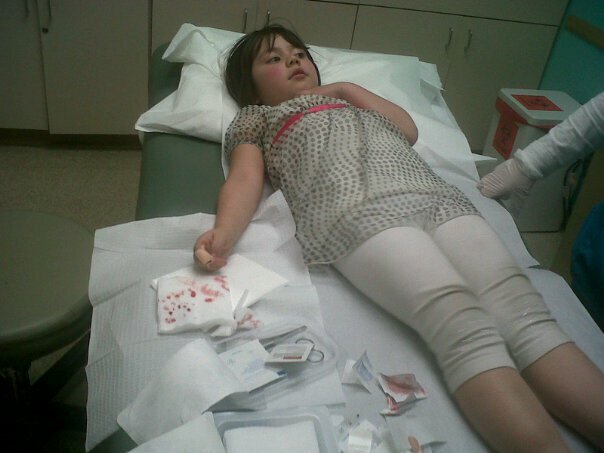 It turns out that when she smashed her finger, she began to bleed inside her finger. The blood had nowhere to go so it was pooling up in her finger, causing it to look black and slowly increasing the pressure inside her finger, causing discomfort and pain. 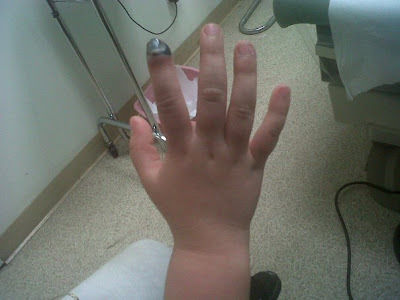 The doc explained that we will need to drain out the blood by making an incision on her finger. My daughter didn't like that plan all too much. She's not a fan of seeing blood and instantly associates blood with pain. I told her what they were going to do and assured her that all would be ok. After telling her that it wouldn't hurt and that she would feel nothing but a sting, she lied down on the bed and braced herself. The doc used this super hot needle/pen thing to burn a hole in her nail. He lightly tapped the nail until he got under the nail and blood began to drip. I assume that the doc realized that the blood was not pooling under her nail but on the side of her finger so he grabbed a needle and poked a small hole on the side of the finger. Bingo. Blood oozed out of the finger. All the while, my daughter kept cool and collected. The doc then applied a little pressure to get the blood out of the finger and prescribed some antibiotics, just in case. No complications, no nothing. Just soak it in warm water and watch out for any discomfort or pain. As long as there's no pain, there's no problem. So that's the story. So far, no pain. Her finger no longer looks swollen, but it's still a little black. But at least it's a lighter shade of black. I'm certain that after a few more days of soaking it in warm water, it'll start getting it's normal shade of pink, or is it brown? Let's just call it human. lol I'll keep you posted on her recovery but she's a 5 year old girl that's super active. Good luck in trying to keep her in "recovery" mode. Until then, later! but she is a brave girl! My daughter just did the same thing to her finger last week and it looks like your daughters. She also slightly broke the tip of the bone. We took her to the doc and they drained it but, it now has the bump above the finger nail. Maybe this is the fingernail falling off.... Im curious how long it took your daughters finger to heal and did her nail fall off? It definitely was a few weeks before the nail fell off. We were hoping that it wouldn't fall off but we had to explain to our young one that it had to go before a new one grows out. Luckily for us, she didn't have any broken bones but her finger was swollen. The swelling took about a week or so to go down completely. Vitamins definitely help. They sped up the nail growth so I strongly suggest you get some vitamins if you haven't already. I didn't see a new nail until the old one fell off so don't be discouraged if you don't see a new nail right away. For a second I thought she wouldn't grow a new one but once the old one fell off, the new one started to come out. Help that helps!